"Hey, if you read only one 'management' book this decade...I'd insist that it beCrucial Confrontations." --from the foreword by TOM PETERS"Revolutionary ideas...opportunities for breakthrough..." -- STEPHEN R. COVEY, author ofThe 7 Habits of Highly Effective People"...unleash the true potential of a relationship or organization and move it to the next level...."-- KEN BLANCHARD, coauthor ofThe One Minute Manager® andThe Secret: What Great Leaders Know--and Do"The most recommended and most effective resource in my library." 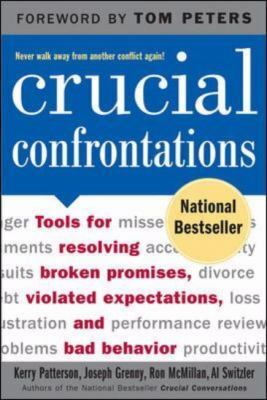 -- STACEY ALLERTON FIRTH, Vice President, Human Resources, Ford of Canada"Brilliant strategies for those difficult discussions at home and in the workplace..."--SOLEDAD O'BRIEN, cohost of CNN's Morning Edition"This book is the real deal....Read it, underline it, learn from it. It's a gem." -- MIKE MURRAY, VP Human Resources and Administration, Microsoft (retired)NEVER WALK AWAY FROM ANOTHER TOUCHY, CONTROVERSIAL, OR COMPLEX ISSUE--AT WORK OR AT HOME!Behind the problems that routinely plague families, teams, and organizations are individuals who either can't or won't deal with failed promises. Others have broken rules, missed deadlines, or just plain behaved badly. If anybody steps up to the issue, they often do a lousy job and create a whole new set of problems.New research demonstrates that these disappointments aren't just irritating--they're costly--sapping organizational performance by 20 to 50 percent and accounting for up to 90 percent of divorces. Drawn from over 10,000 hours of real-life observations,Crucial Confrontationsteaches skills to increase confidence in facing tough issues. Learn to: Permanently resolve failed promises and missed deadlines Transform broken rules and bad behaviors into productive accountability Strengthen relationshipswhilesolving problemsPatterson, Kerry is the author of 'Crucial Confrontations Tools for Resolving Broken Promises, Violated Expectations, and Bad Behavior', published 2004 under ISBN 9780071446525 and ISBN 0071446524. Loading marketplace prices 24 copies from $1.40 How does the rental process work?